The forever home is quickly taking shape! Two weekends ago Branko had a "drywall party" while I spent the weekend at my parents place. To be honest, it was hard being away and knowing so many changes were happening so quickly! I kept harassing Branko for pictures but he really wanted me to be surprised. When I arrived home Sunday night the guys were all gone and all that was left were some really pretty white walls! We've been staring at insulation for so long you forget how pretty white space can be. Between 4 guys and 2 days of working they managed to put up 120 sheets of drywall! The job certainly isn't done and he is having them over again during the last weekend of April. Branko had already scheduled tapers to come from April 27th - April 30th to complete the job! This is very exciting considering "foreverhomebaby" is due to arrive May 13th! ****Important note - these guys failed on us. They told Branko they can now only work weekends which doesn't work for our situation. We are now resorting to Plan "B" to be ready for a baby living under this roof*** More on that another day when I won't feel like I will be crying writing up that entire post. The pictures are not so glamorous yet but still oh so very pretty to look at! In my eyes anyways! 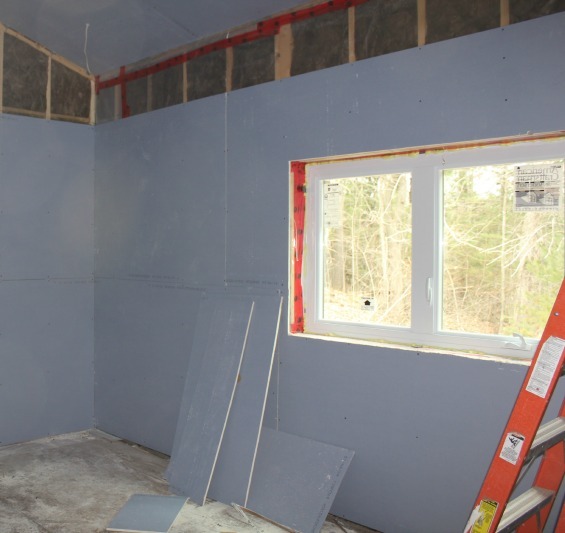 Living room windows, some drywall needs to be cut out still. The fireplace is directly across from the windows. Master bedroom - the room faces the back yard which will be great for privacy. Master bedroom - back wall across from the windows. Master bathroom - a soaker tub will sit under the window and to the left will be a standing shower. Across from the window is the vanity with the toilet to the left of the vanity across from the shower. Hall way - we ensured the hall way is 4ft so it didn't look too narrow. This leads to the linen closest, bathroom, and 2 bedrooms. Bedroom 1 - each bedroom has 3 windows. This room has one facing the backyard and two facing the side yard. Bedroom 2 - One window faces the front yard and 2 windows facing the side yard. The second dry wall party happened over the weekend. Looking forward to snapping some pictures of all of the work that was done and sharing our progress!